All you romance fans (of which I include myself) - have I got a tale of love for you! 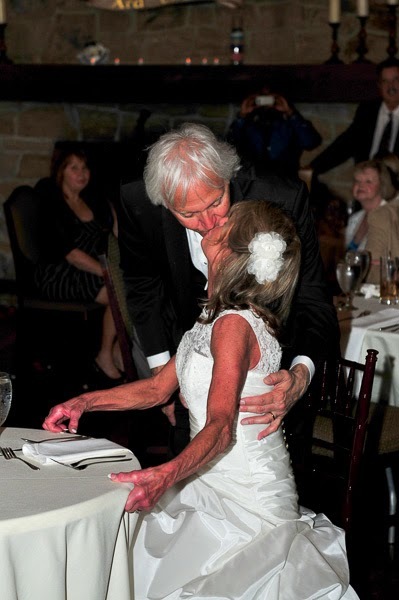 Meet Debi and Rick, the couple who gave all for love and finally got a chance to be together after 45 years. They met back in 1969, when she was 15 and he was 20. Immediately there was a spark and they started dating a while later. But as life will do sometimes, their paths were not yet to intertwine and in 1974 their lives took completely separate directions. Fast forward to 1989. By now both had married other people and become parents, but Rick was single again. He thought of Debi all the time and wondered what had become of her so he started looking for her online through all the people-search websites. His search was to take him 11 years (! ), but in 2000 his efforts were finally rewarded when he found her at last. I can only begin to imagine how excited and nervous he must have been when he reached out to contact her. But again, things were not yet to be. 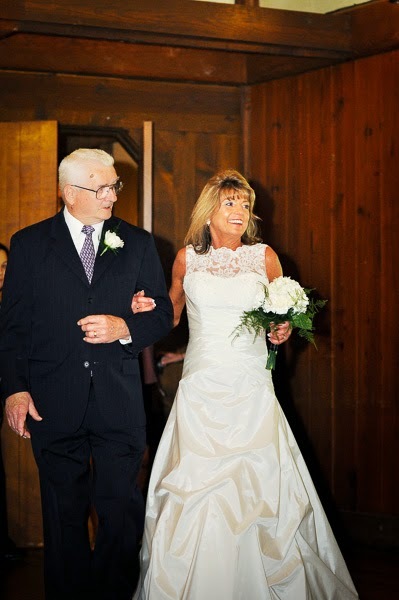 Debi was married and raising her children and Rick respected that. 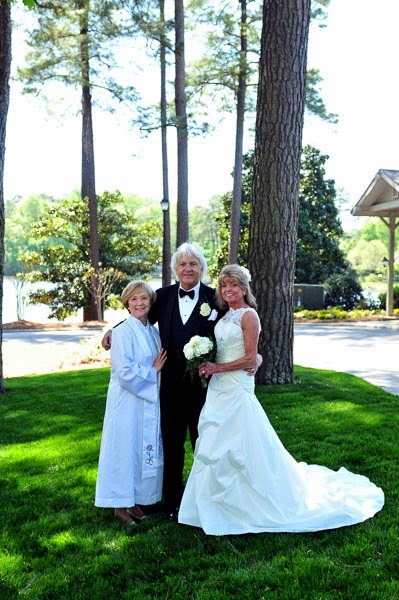 For the next 10 years, Rick would contact Debi from time to time, just to chat, but even when Debi was divorced herself, her first priority was raising her children so she would not consider a move or relationship that might rock the children’s lives. Then in 2010, Rick sent Debi a text message asking how she was doing. It took her a week to answer, but this time things had changed. They’ve been together ever since and a more loving couple you could never meet. 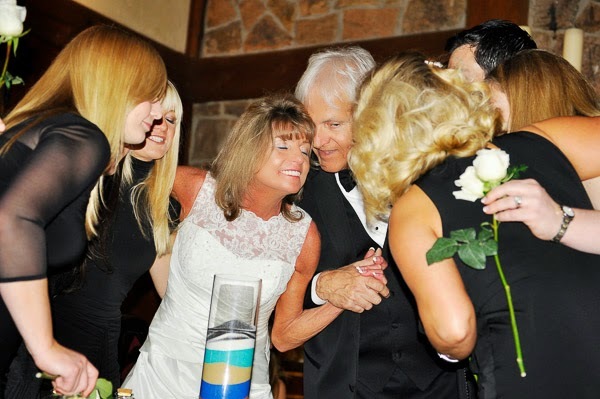 So lucky me, I get to enter their love story in 2013, when they contacted me to help them create a blended family wedding. 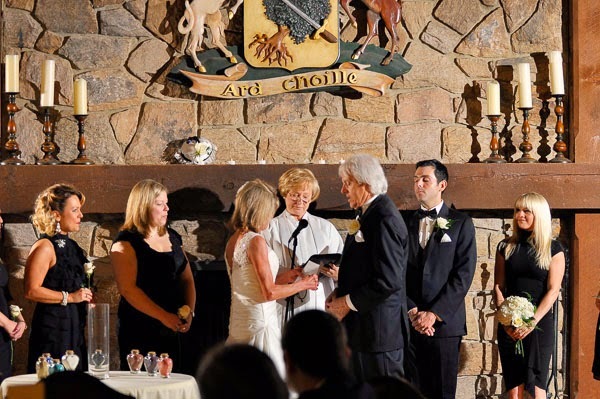 This was the most important thing to both of them and there were elements of family all through the ceremony in fun and unexpected ways. 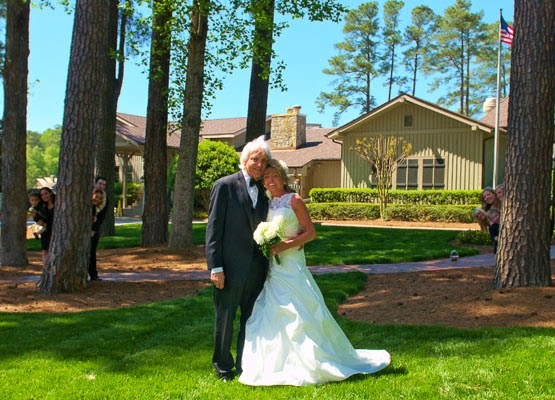 Rick is a golfer (and Debi is learning to golf) so it was a perfect match for them to choose the charming MacGregor Downs Country Club in Cary for their wedding location. 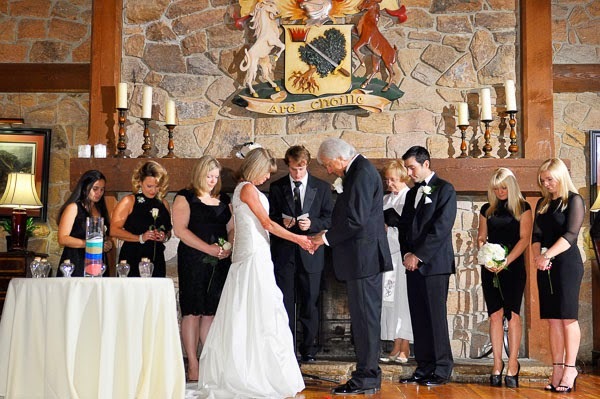 One of my favorite wedding venues in our area, Linda Bennett, the Events Manager there, was at the helm to make sure this very special wedding went off without a hitch. And she was superb at it. 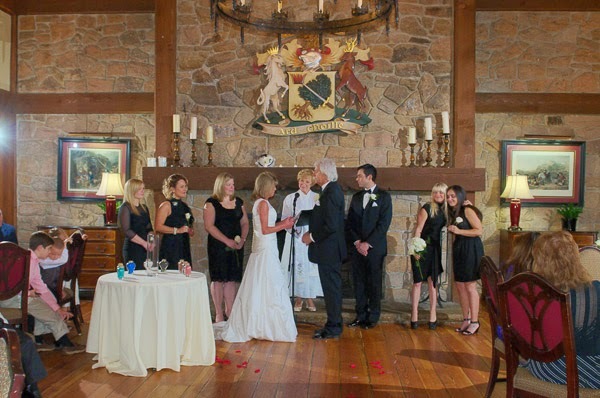 The ceremony and reception took place in the wood-paneled room with the giant stone fireplace at one end. 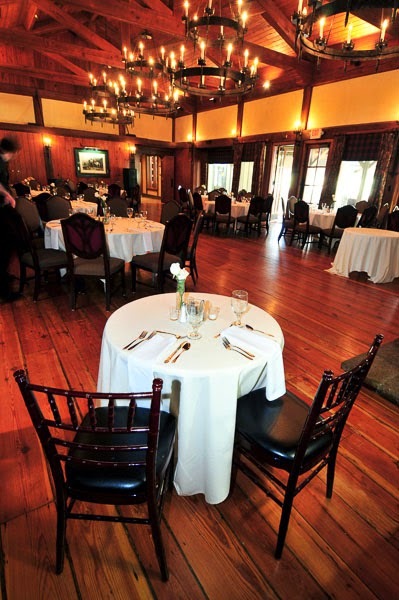 Between the dark wood, the wrought iron candelabras hanging from the gabled ceiling and the giant coat of arms above the fireplace, this room creates the romantic feel of an old Scottish hall. Before I go any further, I would like to note that all the photos here were taken by their photographer, Kevin Nadeau, of K Nadeau Photography. 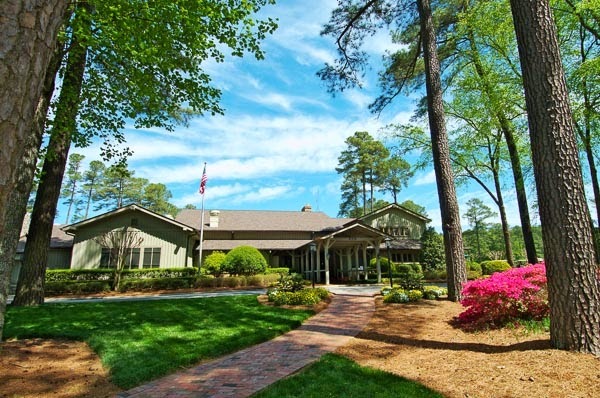 Thanks for the use of your photos, Kevin! 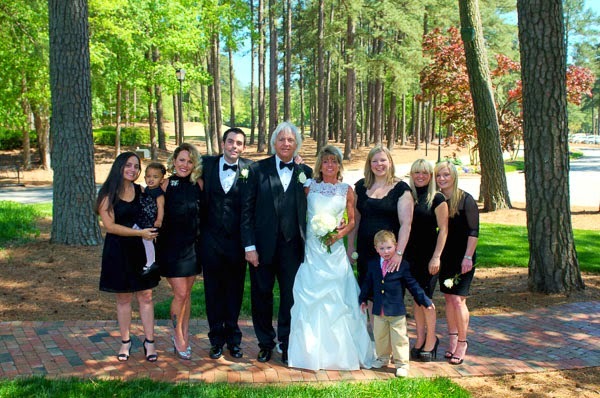 So how did Debi and Rick include the importance of family for this wedding? Let me show you, with the help of Kevin’s photos. Their children were their wedding attendants and when Debi and Rick each said their vows, one attendant from the Bride side traded places with the corresponding attendant on to the Groom side, so that by the end of the vows, two attendants on each side had crossed over. 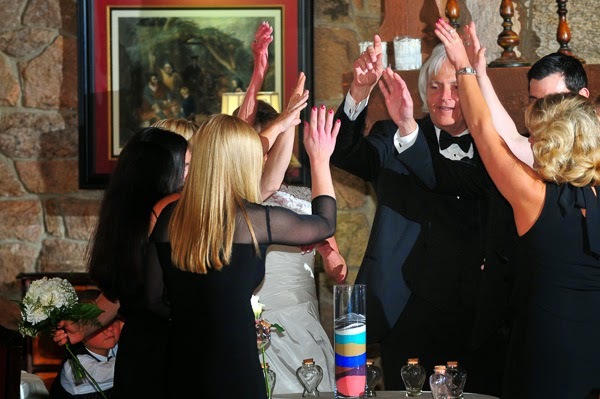 I had never seen anyone do that before and it was a great show of family solidarity. I love the Norman Rockwell feel of the photo above. 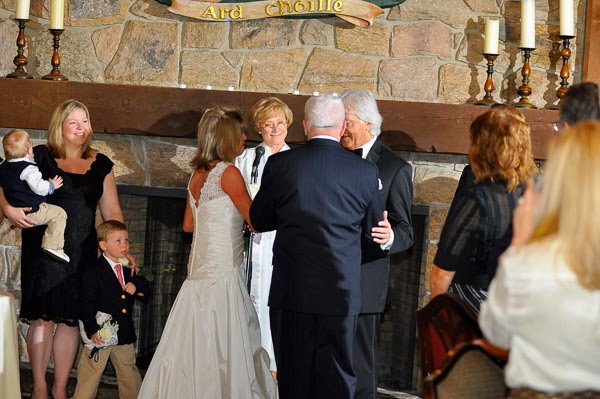 Note the girls hugging and the grandsons on the left with their heads together at their chairs. Great catch, Kevin. 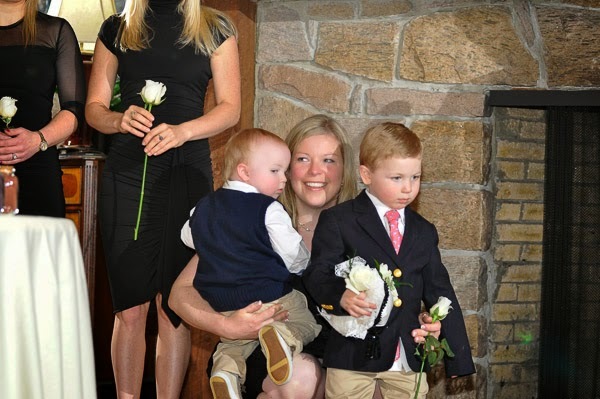 The two Ring Bearers were their young grandsons, one of which is carrying a ring pillow made by Debi from one of her mother’s hankies. This was especially poignant as Debi’s mother has passed away and they had chosen this day for the wedding because it was her mother’s birthday. What special ways to remember her. 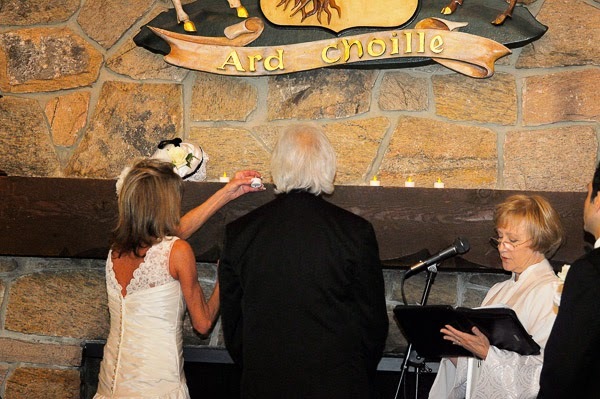 To begin the ceremony, Debi and Rick put the ring pillow on the mantle and lit memorial candles to honor those who had passed in their lives, as I read out their names; her mother and brother, his parents and brother. It was very touching. Then came the ring exchange, which both did with tears in their eyes. 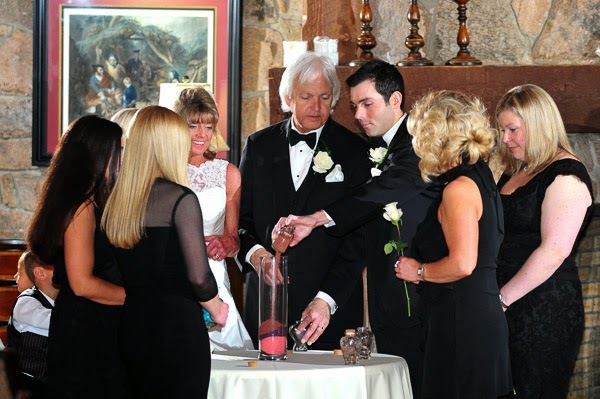 After the vows came the family sand ceremony. 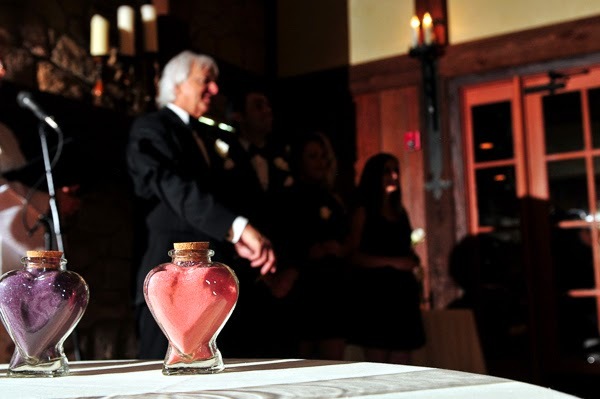 Everyone gathered around a table where eight miniature, heart-shaped vials of colored sand had been placed - one for Debi and Rick and each of their six children. 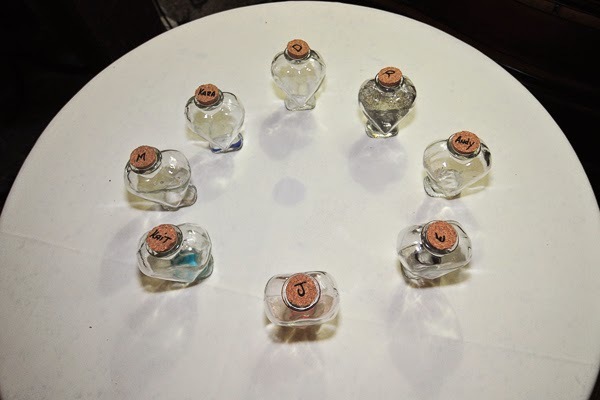 The cork of each jar had the person’s initials on it where they would be standing at the table. 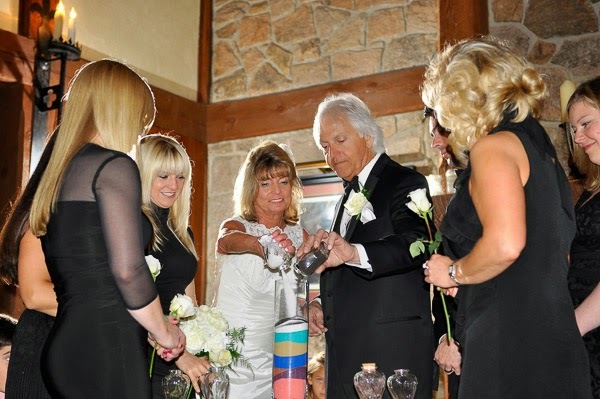 Debi and Rick poured some of their colors first, as a base. Then each child poured theirs in order of age - oldest to youngest. 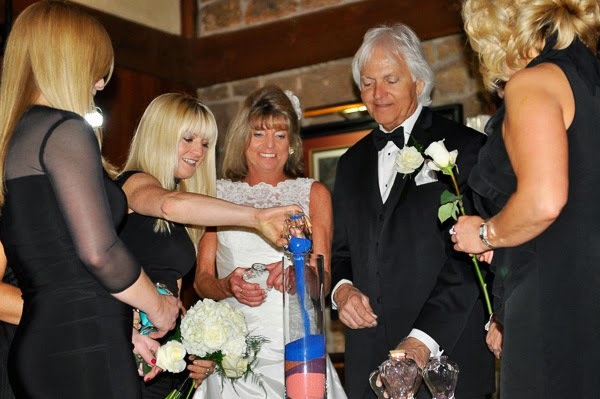 Then Debi and Rick completed the beautiful family creation by finishing it off with more of their sands. What a wonderful family keepsake! and a rousing high five! 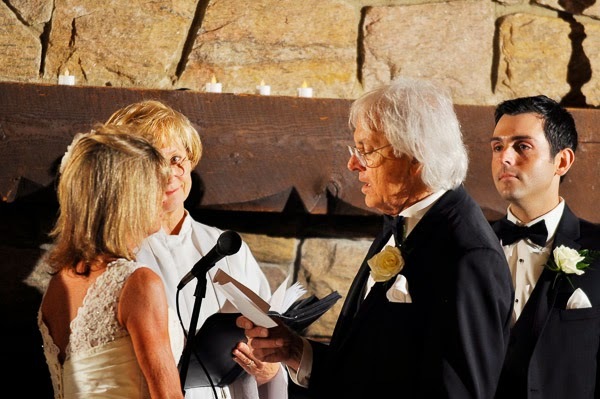 We finished the ceremony with another of their grandsons reading the closing prayer. As they recessed out the aisle, it seemed like their feet were barely touching the floor and everyone there was as thrilled as they were. The great musical score for the event was created by Debi and Rick and performed with great care by their DJ, Matthew Russell, of Russell Entertainment. He and his brother - partner, Cameron, can be reached by phone at (919) 929-3796. 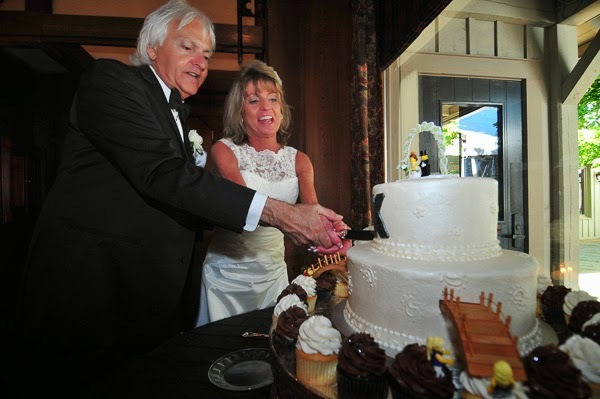 Their wedding cake was very unusual. 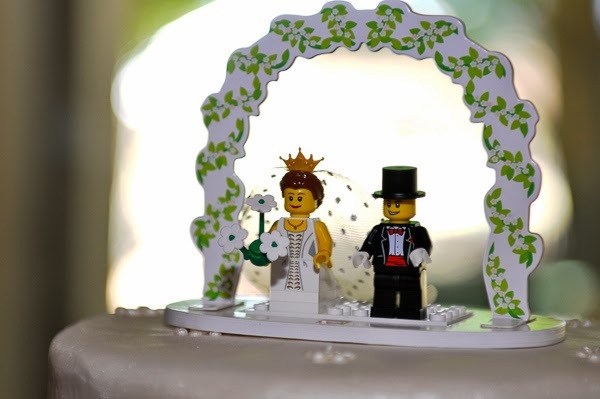 With a Lego Bride and Groom topper and Lego people walking across two bridges, I had to ask Rick what that signified. 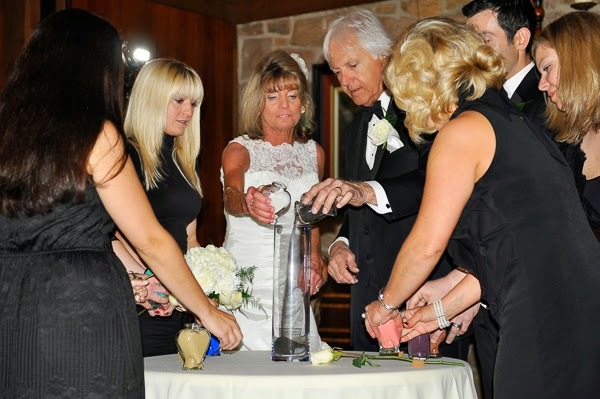 He told me it represented their children and grandchildren and the bridges represented he and Debi, who are the bridges for this newly created family to come together. Nice. 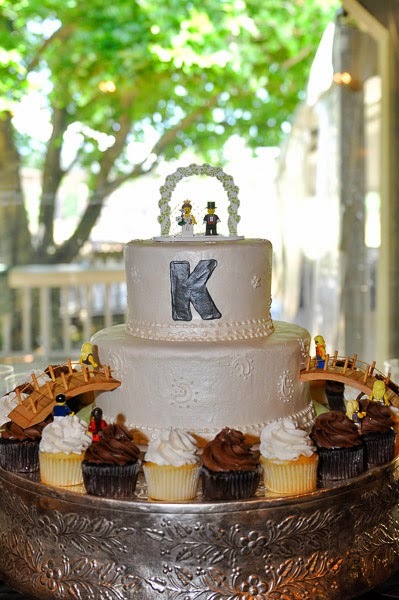 Kevin posted these wonderful photos he caught of the newlyweds during the reception. They touch my heart. 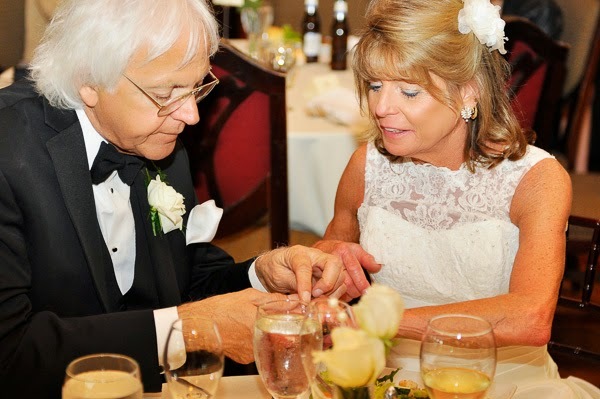 Here they are looking at her rings. And here they share an impromptu kiss. But to me, this one really speaks of who they are. 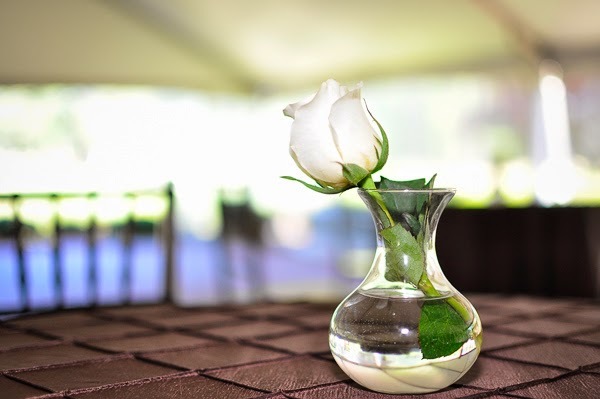 A single white rose, alone on a table, reminds me of the sweet love that never died, waiting 45 years to bloom, and then bloom it did, in a pure, simple and elegant way. 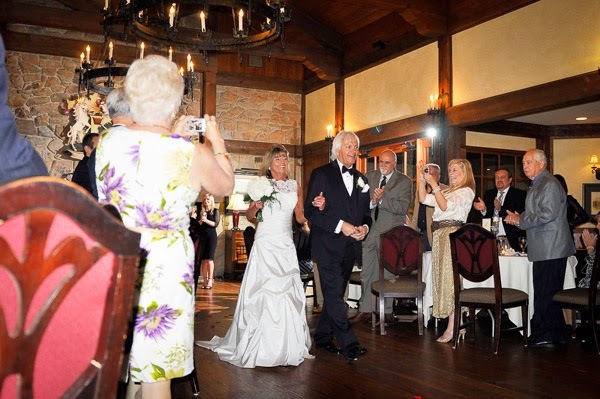 Thank you, Debi and Rick, for including me in your magnificent display of love for each other, your children, your grandchildren, your family and your friends. You are rich beyond measure and so lucky to have found each other again.You are living proof that no matter what life brings to us, when love is at our core, the beauty of Life cannot be stopped - it shines through in all its many, many forms. I can see that in your eyes.